Chris Bosh became the final member of Miami’s Big Three to be named the NBA’s Eastern Conference Player of the Week this season. Bosh averaged 22.3 points and eight rebounds to help the Heat go 3-1 last week. LeBron James (twice) and Dwyane Wade previously won the award. 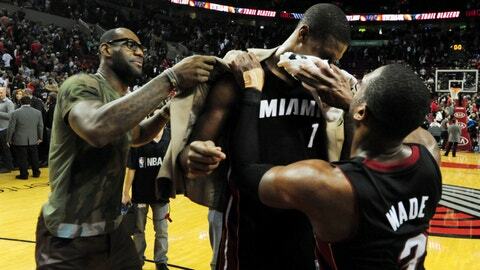 It marked the first time Bosh earned the accolade in four seasons with Miami. He previously received the honor six times while playing for the Toronto Raptors. "It’s nice to get awards," Bosh said. "To get something I haven’t gotten in a long time is awesome." Bosh’s highlight moment of the week came Saturday night, when he sank a 3-pointer with 0.5 seconds left to give Miami a 108-107 road victory over the Portland Trail Blazers. With James sidelined due to a groin injury, Bosh scored a season-high 37 points and grabbed 10 rebounds to help deal Portland its third loss at home this season.